The numbers of pupils at the school continued to grow as more and more houses were built on Stanmore Estate. As a result the Education Committee needed to find a more strategic solution than the converted tin hut. 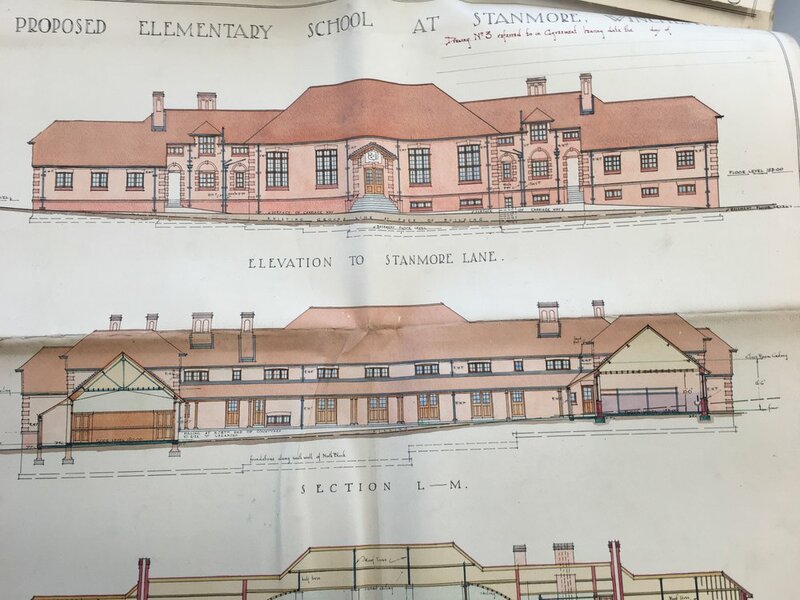 Having purchased three acres of land on the south side of Stanmore Lane, a contract for architectural services to design a public elementary school at Stanmore was awarded on 12 March 1927 to Cancellor and Sawyer. 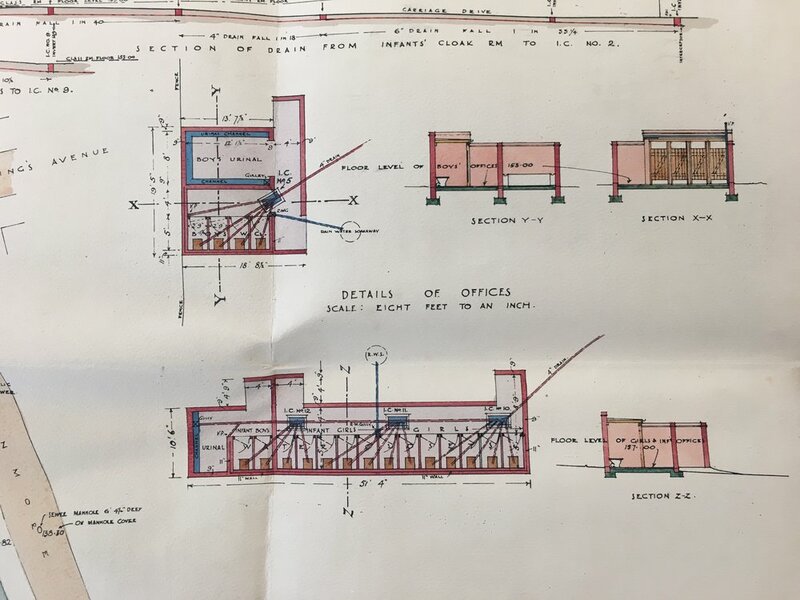 The design was completed and the construction contract signed on 30 January 1928, awarded to H J Goodall and Son for a total of £16110 3s 0d. The next day children from the school attended a ceremony to cut the first sod for the new school performed by Alderman Edmeades, the Chairman of the City Education Committee. No sooner had construction started however, negotiations to buy more land and extend the school were underway, but that would take another few years to come to fruition. On the 29 August 1928 the formal notification for “providing additional accommodation for about 80 children” was posted. 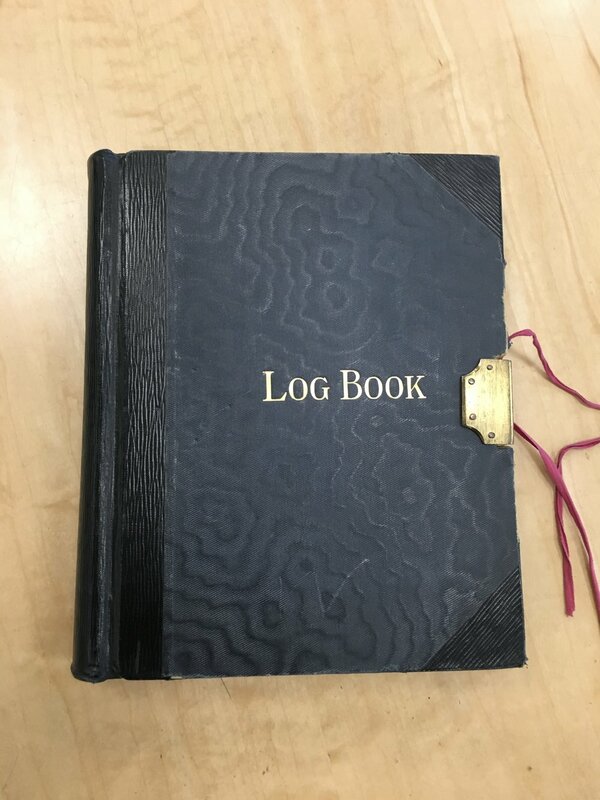 As pupils returned to school in September 1928, entries in the school log book tell us that children were being educated in the parish hall as well as the “hut'“ due to the sheer numbers. The arial photograph from this month shows us how advanced the build was, but also clearly shows how big the original site was (no back field to speak of). Children started in the new school building in January 1929. But there were now effectively two schools operating in the building, the Junior Department - still led by Miss Williams and the Senior Department - led by Mr G. H. Barker. The Junior school, already established in 1922 didn’t need a formal opening ceremony, but the Senior school was new and so a ceremony was held on 8 January 1929 to formally open this new school. 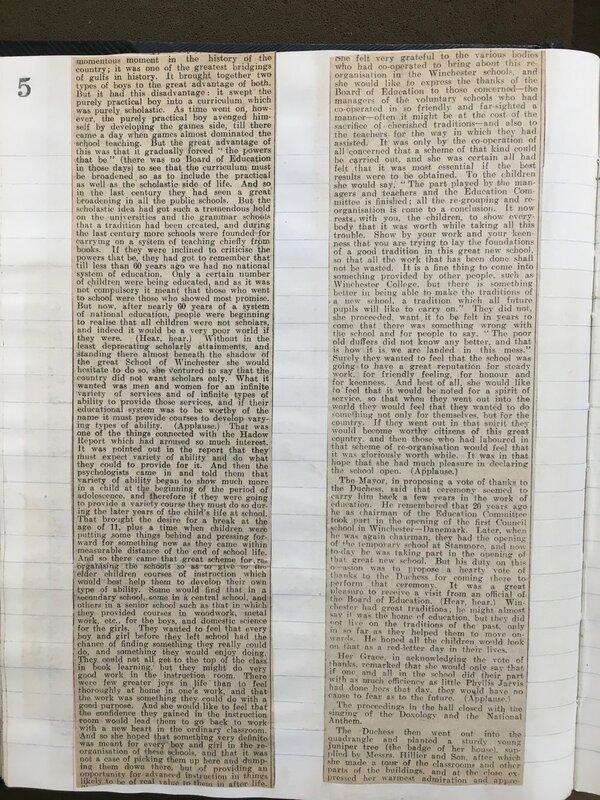 The Junior Department occupied seven classrooms with over fifty pupils in each, and the Senior Department had around one hundred and fifty pupils. There were some early teething issues, with sorting pupils into the right classes throughout the school and the new heating system breaking down and closing the school from the 12 to 25 February. 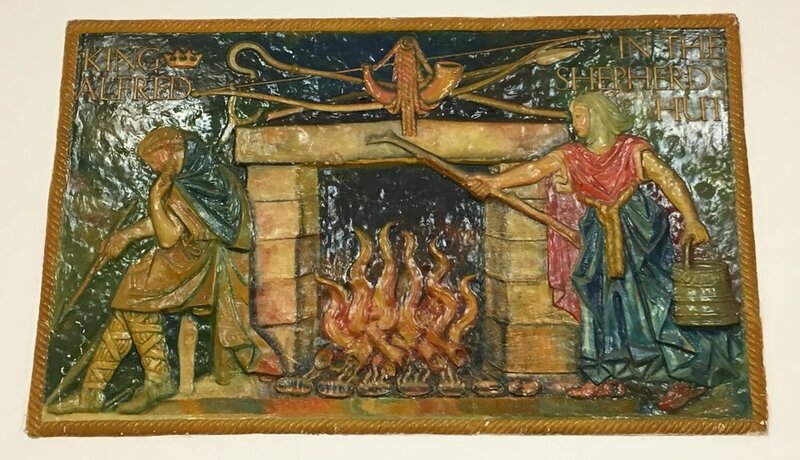 From the Hampshire Chronicle article, we also find out where the historic plaster plaques in the school hall came from - a donation from W. H. Smith and Sons. The Duchess planted a Juniper tree in the grounds at the end of the ceremony - perhaps that is what started our classes being named after trees! And so started life in the building we still call our school today. This afternoon, the elder children left school at 3 p.m. to attend the ceremony in connection with the cutting of the first sod on the site of the new elementary school. The ceremony was performed by Alderman Edmeades, the Chairman of the City Education Committee. School re-opened this morning. The top class has returned from the temporary premises which they occupied before the holidays. Standards I & II have been transferred to the Stanmore Parish Hall until the new school is completed. […] Twenty two new admissions were made. School re-opened this morning in the new buildings. We are occupying the five classrooms on the Junior side, one classroom on the Senior side and the Art room. The numbers are large, therefore the classes have to be 50 and over in numbers. The work of the school has been somewhat disorganised this week and because of new admissions, children have had to be promoted the whole way up the school. The fact of the builders being still in the school has rendered things more difficult. A large number of children are suffering from chickenpox. The official opening of the school which was to have been performed today by the Duchess of Atholl, has been postponed on account of the illness of Her Grace. School has resumed this morning, the heating apparatus having been attended to. The school was formally opened this afternoon by Her Grace the Cuchess of Atholl DBE, MP, Parliamentary Secretary to the Board of Education. The service was attended by the Chairman and Members of the Education Committee, town councillors, prominent citizens, parents of scholars and scholars from the top class of this department. H M Inspector W G Winn Esq was among the visitors. Alderman Edemeades, CBE, DL, JP (Chairman of the LEA) formally opened the senior school. Children assembled in the Hall, and were addressed by the Chairman and Director of Education. In spite of difficulties, the school is now in working order. All classes are at work. School reopened. Official opening of the school by Her Grace, The Dutchess of Atholl, DBE, MP. Parliamentary Secretary to the Board of Education. A very representative company gathered in the Hall at 2.30 p.m. Alderman A Edemeades, CBE, DL, JP (Chairman of the Education Committee) was in the Chair, and supporting him on the platform were The Dutchess of Atholl, The Mayor and Mayoress of Winchester (Councillor W G Symes, and Mrs Symes) Mrs D Edemeades, Rev. W. Glass, Rev. R Sidney Jones. Mary Smelgrove (Senior Girl Prefect) read the School Prayer, and Denis Bayley (Senior Boy Prefect) acted as pianist. The photograph also includes Alderman Edmeades, Miss D Edmeades, Mrs Symes and Mayor Symes, Rev Glass and Rev Sirhowy Jones. 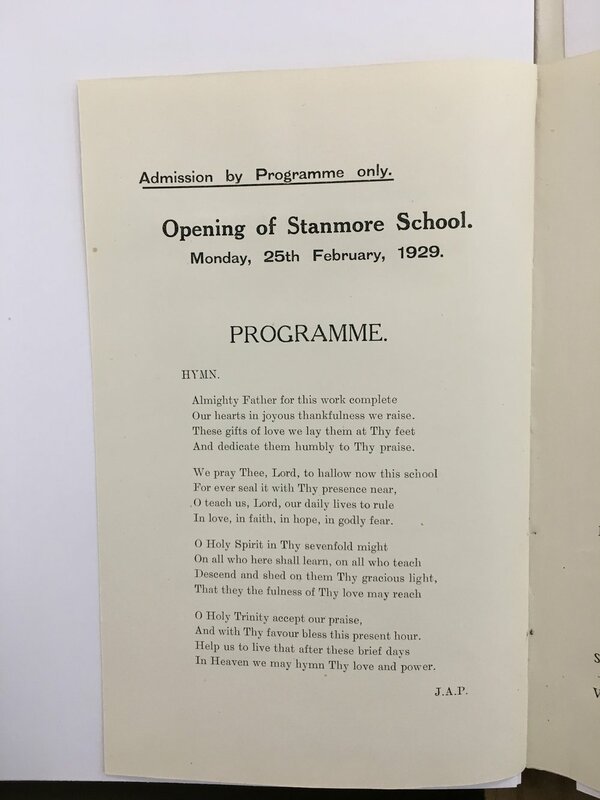 Opening of Stanmore School by Duchess of Atholl. Headmaster, G. H. Barker holding book. DUCHESS OF ATHOLL AT WINCHESTER. THE NEW SYSTEM IN EDUCATION. 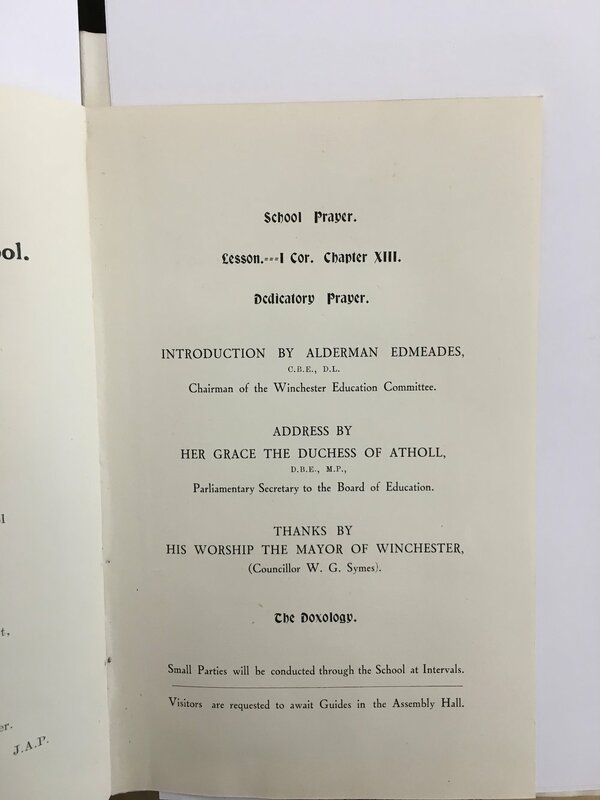 The visit to Winchester of the Duchess of Atholl, D.B.E., M.P., Parliamentary Secretary of the Board of Education, for the purpose of formally opening the new Council School at Stanmore, which was postponed from February 1st, owing to the illness of her Grace, took place on Monday, when a large gathering of parents and friends gathered in the spacious assembly hall of the school for the interesting ceremony. The Duchess was, prior to the ceremony. the guest of Alderman A Edmeades, C.B.E., D.L., at luncheon in the Guildhall, where the Mayor and Mayoress, the members of the Education Committee, and a few other friends were invited to meet her Grace. Miss Doris Edmeades played the part of hostess. The party then drove to the school, making a tour of the Stanmore estate en route. At the opening ceremony Ald. Edmeades presided, and was supported by the Duchess of Atholl, Miss Doris Edmeades, the Mayor and Mayoress (Councillor W. G. and Mrs. Symes), the Rev. J. Merryn Glass (vicar of Christ Church). the Rev. R. Sirhowy Jones (Free Church Council), and Mr. J. A. Peart (Director of Education). Others who were seated near the platform included ; Alderinan W. H. and Mrs. Forder. Alderman J. S, and Mrs. Furley. Alderman H. P. Vacher, Alder man H. D. Johnson, Councillors Mrs. Hooley. H. Collis, WV. Hayward, R. L. G. Irving, Lt. Col. H. D. Ross, Lt.-Col. E. A. Dickinson, W. J. Lansdell, F. M. Newton, W. Hamblin, G. Ludford and J. 0. Hodder. Mrs. Theodoro Woods, Mrs. Mervyn Glass, Miss Kingsmill, | Miss Douglas, Mrs. Munt, the Very Rev. 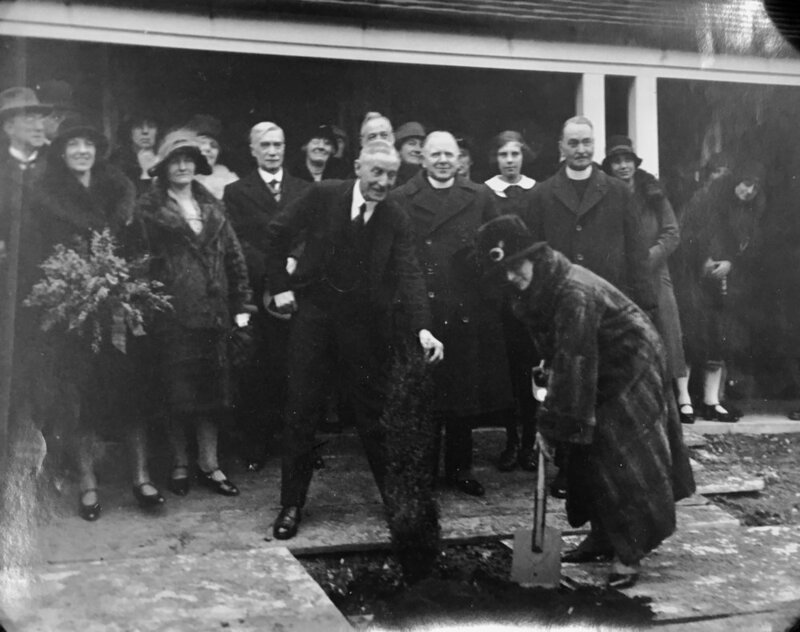 (builder) and Mrs. Goodall, Mr. Stanley Wharton (City Accountant). Mr. W. J. G. | Winn. H.M. Inspector of Schools for Hamp: I shire boroughs; Dr. Nash, Medical Officer of | Health for Hounslow, who is an expert en I school hygiene; Mr. W. Baylis, estates man. ager for Messrs. W. H. Smith and Son: Mr. F. W. Goldstone, general secretary of the National Union of Teachers; Mr. G. H. Barker, 31.0:. bread master; Miss Williams, M.I.N.. head mistress; Dr. Hugh Jones, assistant to the Director of Education: Mr. Kingo (foreman of works for the builders). and others. The senior children were grouper at the far end of the hall. Mr. B. D. Cancellor, whose firm designed the school and who took a personal pride and interest in its erection, is unfortunately laid in in a nursing home and consequently to his great disa appointment was unable to be present..
And dedicate them humbly to Thy praise. In love, in faith. in hope, in godly fear. That they the fulness of Thy love my reach. And with Thy favour bless this present hour. Heaven we niny hymn the love and power. Then the school prayer was recited by Mary Snellgrove, the senior girl prefect in the senior department, who had a seat on the platform. The Rev. R. Sirhowy Jones read from 1 Cor. xiii, St. Paul's famous exposition of the relative merits of faith, hope and charity, and the Vicar of Christ Church read the prayers. A tiny tot, Phyllis Jarvis, one of the infant scholars, who was prettily dressed in white, then mounted the platform and presented to her Grace, on behalf of the school, a beautiful bouquet of white heather, tied with ribbon of the Murray-Atholl tartan. Alderman Edmeades, in an introductory address, said he thought the Education Committee of the city of Winchester might feel some gratification at the completion of so large a work in having erected that modern school in such charming surroundings, though the surroundings at present were not quite what they would be in a few months' time. They had a large playing field to the right and another to the left, and hoped to have a garden in the quadrangle. They had arrived at that stage with a certain amount of satisfaction in achieving the object which had been in their minds for some years, and it illustrated in some sense a new outlook on education in the city. Under the city's housing scheme some 700 houses had been erected in that neighbourhood, which meant a large addition to the school population in the district, and there was a difficulty in accommodating them in the old schools in Winchester. As evidence of the need of the new school and the way in which it was I appreciated. he mentioned that although at present there was accommodation for 480 only, they already had 540 on the books and an insistent demand for more places, and already they were building two additional classrooms. That was a day chiefly for expressing thanks. First of all they had to thank the Board of Education and their officials for their friendly assistance and advice. No one knew more than he how necessary it was to get the concurrence of a number of authorities, such as the Ecclesiastical Commissioners who were the owners of the land, the Church Schools Association, and others, but more than all going humbly to the Board of Education for their sanction. He was bound to say that they had been met with the utmost kindness and consideration by all the officials of the Board of Education, and they were deeply grateful to them. Next they were largely indebted to the architects Messrs. Cancellor and Sawyer, for what had been done, and he ventured to: I think her Grace would agree had been well and truly done in planning those buildings. He sincerely regretted in that connection that Mr. Cancellor, the senior partner in the firm, was owing to rather serious indisposition unable to be with them that day to see the opening of the school in which he had taken so great an interest. (Hear, hear.) Their thanks were also due to the builder. Mr. Goodall. and his staff and particularly his superintendent of works. Mr. Kinge. 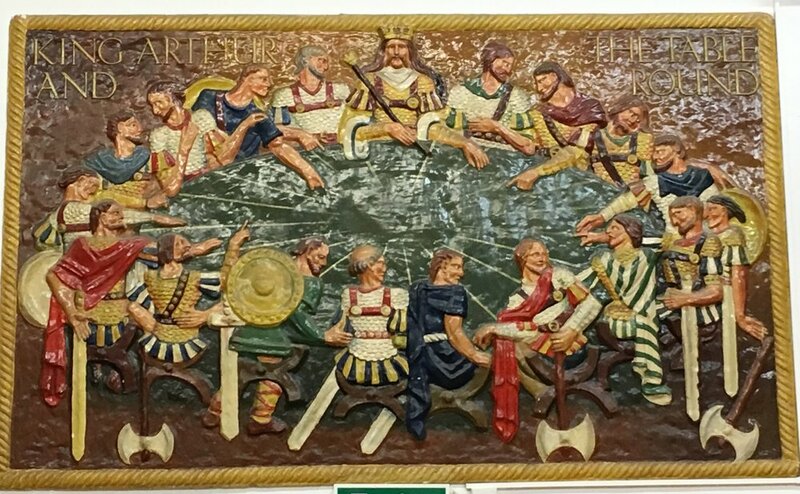 He (the Alderman) had never seen a body of men work so well and so harmoniously, and he thanked them for what they had done. (Applause.) Then they had a comparatively now heating scheme, which was not too well known at present, but was likely to be better known| as the result of using it there, and to the heating engineer, Mr. Heading their thanks were due. Nor must he forget a real friend of that school. Mr. Baylis, of the firm of W. H. Smith and Son who had given them those beautiful placques representing scenes of historical interest: for instance, they had there over the platform a representation of King Alfred and the cakes which would be a permanent ornament to the school They were very grateful for that kind consideration." Applause.) One other word of thanks. He was happy to see such a large number of parent's present, and he thanked them for this evidence of their interest in the school and appreciation of what had been done. The Duchess of Atholl, who was received with great applause, said the first thing she wished to do was to thank the kind donors in whose name the little girl had presented her with that lovely bouquet of flowers, which were familiar and dear to her, and tied with ribbon which was not unfamiliar and not repugnant. (Hear, hear.) She was very sorry that, as Alderman Edmeades had mentioned, she was obliged to postpone her visit from the original date, but was glad it had been possible to come at that later date. That school, she proceeded, was one of many tangible and very interesting signs of a great movement going on in the country--she saw it all over the country as she went from place to place and that was the redistribution of the population. It was the bringing out from old-fashioned houses and crowded streets of men and women and children into new houses, more comfortable and healthier homes, amid beautiful and spacious surroundings. Of course that meant that new schools must be provided, and so that great movement of the population of which she saw welcome signs on their new housing site through which she drove, imposed fresh responsibilities on the education authorities. She was sorry it should thought she was not interested in school buildings, for although she was infinitely more interested in children, to see that now commodious and well-planned school, set in such beautiful surroundings and close to a group of new, healthy houses, was a sight which rejoiced her heart, and she was proud to have the privilege of taking some part in starting that school on its way. 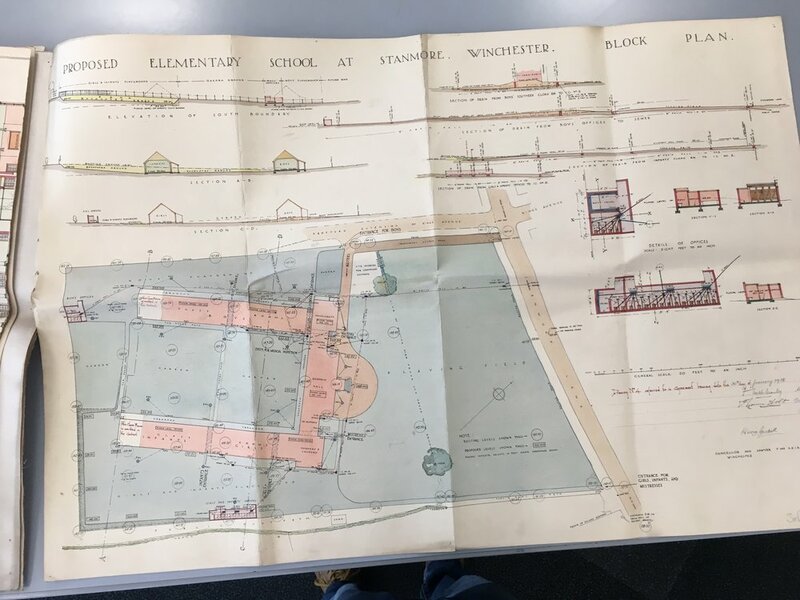 But not only was it a sign of the moving of families, it was also a sign of the re-organisation of the schools in Winchester which had been taking place since 1920 and had lately been completed. She understood that they had now grouped the older children, those over 11, into three Senior schools and one Central school, and, as the chairman had said, the thanks of the Education Committee and the Education Authorities were due to the owners and manure of the Church schools, whose co operation was indispensable, and also to the teachers who had been transferred. And alte was glad to find that the Board of Education had not been unhelpful (Hear, hear.) The Board has been working for such schemes as that all over the country for several years past. Even before the issue of the Hadow Report the Board realised the need of some satisfactory scheine of re-organisation being carried through. The reason for this was well known to the chairman and the members of the Education Committee and the school managers, but perhaps some people might ask, "Why all this change? Why is it necessary to take the children from the schools they have always attended and dump them down in a fresh place?" For the benefit of those who did not understand she would try to explain these schemes. In the first place, if the school was not very big it was impossible without a large number of teachers for a small number of children to have all the children of one age in a class by themselves. If in a small school they had to have the children of 11, 12 and 13 all together it did not give them a real chance. The great aim of the new scheme was not only to group children' according to age, but also according to the ability they show. They wanted to provide instruction for children who showed practical rather than literary ability. The Act of 1918 required that equipment should be provided for that purpose, but the equipment was very expensive and could not be put into small schools. She felt that practical instruction should form part of the education of every child, and that they were not fully educated so long as their hands were not educated. (Hear, hear.) She lamented very much that this great educational truth was not realised when she was a child at school; she felt it was a real gap in education. Therefore they had got to group the elder children in schools where it was possible to provide the necessary equipment. That was a plan the value of which was not so fully recognised as it should be, and she was not sure that in an old centre like that, which was connected with the Church and the traditions of a great school like Winchester College, there might not be more difficulty in recognising the necessity for providing for different types of ability than in some areas. Why was that? She looked back over the history of education, and she remembered that education, like art and music, was cradled in the Church. The secondary schools of today emerged from the old grammar schools attached to the cathedrals, and the residential schools owed their origin to the great public schools or colleges established by the Church. The primary object of the schools in the Middle Ages was to train boys for the service of the Church. It was true that as time went on and the Universities were established they might have provided for the study of the law and of medicine (in so far as medicine was known in those days), but in the main it was for the Church. In the early days the language was Norman-French, but later on, the language used in the Church and in the cathedral and collegiate schools was Latin. Broadly speaking the people taught in the schools were going to be scholars. But that was not the only kind of education provided in the Middle Ages. There were the sons of men who owned the landed estates, boys who wanted to be soldiers or courtiers or to take a share in the government of the country. Their education was very different from that in the cathedral and collegiate schools. They were generally grouped in the house of a neighbour for several years, and there the were given instruction in their mother tongue, and boys were given a great deal of physical training and were also taught music and dancing with their sisters, and there was a great deal of instruction in the domestic arts. So they had those two types of education in the country. Then came the great Bishop of Winchester William of Wykeham, who wanted to found a school, and he did something of enormous importance, he brought together the boys who were training for a scholarly life and the boys who wanted a life of action. She always felt that the bringing together of boys in the first public school vas a very momentous moment in the history of the country; it was one of the greatest bridgings of gulfs in history. It brought together two types of boys to the great advantage of both. But it had this disadvantage: it swept the purely practical boy into a curriculum which was purely scholastic. As time went on, however, the purely practical boy avenged himself by developing the games side, till there came a day when games almost dominated the school teaching. But the great advantage of this was that it gradually forced " the powers that be " (there was no Board of Education in those days) to see that the curriculum must be broadened so as to include the practical as well as the scholastic side of life. And so in the last century they had seen a great broadening in all the public schools. But the scholastic idea had got such a tremendous hold on the universities and the grammar schools that a tradition had been created, and during the last century more schools were founded for carrying on a system of teaching chiefly from books. If they were inclined to criticise the powers that be, they had got to remember that till less than 60 years ago we had no national system of education. Only a certain number of children were being educated, and as it was not compulsory it meant that those who went to school were those who showed most promise. But now, after nearly 60 years of system of national education, people were beginning to realise that all children were not scholars, and indeed it would be a very poor world if they were. (Hear, hear.) Without in the least deprecating scholarly attainments and standing there almost beneath the shadow of the great School of Winchester she would hesitate to do so, she ventured to say that the country did not want scholars only. What it wanted was men and women for an infinite variety of services and of infinite types of ability to provide those services, and if their educational system was to be worthy of the I name it must provide courses to develop varying types of ability. (Applause) That was one of the things connected with the Hadow Report which had aroused so much interest, it was pointed out in the report that they must expect variety of ability and do what they could to provide for it. And then the psychologists came in and told them that variety of ability began to show much more in a child at the beginning of the period of adolescence, and therefore if they were going to provide a variety course they must do so during the later years of the child's life at school. That brought the desire for a break at the age of 11, plus a time when children were putting some things behind and pressing for. ward for something new as they came within measurable distance of the end of school life. And so there came that great scheme for reorganising the schools so as to give the elder children courses of instruction which I would best help them to develop their own type of ability. Some would find that in a secondary school, some in a central school, and others in a senior school such as that in which they provided courses in woodwork, metalwork, etc., for the boys, and domestic science for the girls. They wanted to feel that every boy and girl before they left school had the chance of finding something they really could do, and something they would enjoy doing. They could not all get to the top of the class in book learning but they might do very good work in the instruction room. There were few greater joys in life than to feel thoroughly at home in one's work, and that the work was something they could do with a good purpose. And she would like to feel that the confidence they gained in the instruction room would lead them to go back to work with a new heart in the ordinary classroom. And so she hoped that something very definite was meant for every boy and girl in the re-organisation of these schools, and that it was not a case of picking them up here and dumping them down there, but of providing an opportunity for advanced Instruction in this likely to be of real value to them in after life. The Mayor, in proposing a vote of thanks to the Duchess, said that ceremony seemed to carry him baok a few years in the work of education. He remembered that 20 years ago he as chairman of the Education Committee he took part in the opening of the first Council school in Winchester - Danemark. Later, when he was an in chairman. they had the opening of the temporary school at Stanmore, and now to-day he was taking part in the opening of that great new school. But his duty on this occasion was in propose a hearty vote of thanks to the Duchess for coming there to perform the ceremony. It was a great pleasure to receive a visit from an official of the Board of Education. (Hear hear.) Winchester had great traditions; he might almost say it was the home of education, but they did not live on the traditions of the past, only in so far as they helped them to move onwards. He hoped all the children would look on that as a red-letter day in their lives. The proceedings in the ball closed with the singing of the Doxology and the National Anthem . The Duchess then went out into the quadrangle and planted sturdy young juniper tree (the badge of her house), supplied by Messrs. Hillier and Son, after which she made a tour of the classrooms and of parts of the buildings, and at the close expressed her warmest admiration and appreciation of all she had seen. Meanwhile the parents and others were conducted over the school in parties. Subsequently the Duchess took tea with the Mayor and Mayoress at the Abbey Houde, and then had to hurry away to the station to catch the 5 o’clock train to London. A projected visit to the Cathedral had to be abandoned for lack of time. Tribute was paid by Mr. J. A. Peart, M.A., Director of Education, to the skill and artistic taste of Messrs. Cancellor and Sawyer, who designed the school, and to the good workmanship of Mr. Goodall and his staff. It was a school of which Winchester may justly be proud, and we have no doubt that it will prove that its erection at a cost of some £35,000 was well worth while.